A spectacular "ring of fire" (i.e. annular) solar eclipse will be visible from northern Australia during Friday morning local time (May 10th), treating lucky star gazers located in that region to their second solar eclipse in less than 6 months. 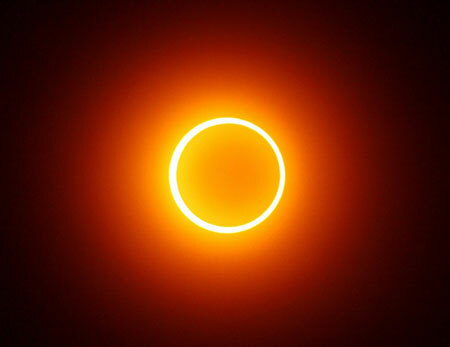 An annular solar eclipse occurs when the Moon's apparent diameter is smaller than the Sun, causing the Sun to look like an annulus (ring), blocking most of the Sun's light. It is also useful to note that we are still in the middle of a galactic alignment called "The Great Shift", witnessing the closing of a Great Cycle of Time and the beginning of another, as the foundations of a new Creation are being laid down for humanity. These events are of major spiritual significance for all of us, however, since they are helping to birth a new consciousness. If we take the hermetic laws "as above, so below", and "as within, so without", we can safely say that the birthing process will not be an easy one for humanity - but the outcome will be joyful (when it does arrive). Those who are 'sensitive' to psychic energies will feel it most but everyone is being affected, whether they recognise it or not. The energetic effects of the eclipse occur up to two or three days before and afterwards, so if you're feeling highly strung, just know you're not alone!